Sankari provided this great sketch for VLV week 2. We are supposed to choose our own inspiration pieces from any holiday decor. 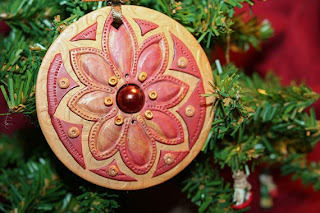 For my inspiration, I chose this ornament I found on Etsy made by izzilu. I really liked the colors of the ornament against the green of the tree. It also resembles a flower! Here's my card. My colors are more muted than those in the inspiration photo, but I'm hoping you can see how it relates to that beautiful ornament. I used dp from Basic Grey's "Curio" collection. The sentiment is from Verve's "Bountiful Harvest." The edges of the sentiment panel are sponged in SU! Old Olive and then I used Vintage Photo Distress Ink over it to give it an aged look. I used my oval Nesties to cut out the sentiment and mat. I used a MS deep border punch and some peach satin ribbon that I have probably had for at least 10 years (felt great to use up that chunk of ribbon!) that I tied with my Bow Easy. The large rose is from Prima, and I think the little one is from Recollections as are the black pearls (you can see them best in the first picture). I hope that everyone had a Merry Christmas! Thanks for stopping by! 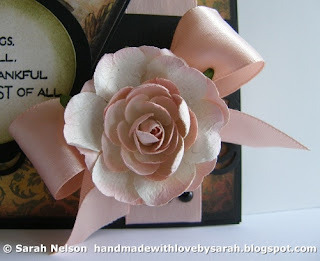 Beautiful card Sarah! I think I need to get some of this paper! lovely card Sarah, I agree the paper is a must to have.